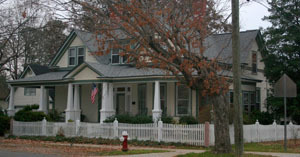 The 2006 society home tour presented the Maynard-Pearson House, the Douglass house, the 1914 Union Depot and the historic Apex Cemetery. The 1870’s farmhouse has changed little since its last remodelling in 1944, in fact a picture in the 1900s shows the original porch across the front and rooms to the rear. 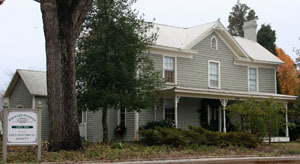 Built by James Jackson Maynard and Civil D. Pearson Maynard, the house remained in the Maynard-Pearson family until 1994 when the farm was sold to M.J.K. Development, which later deeded the house to the Maynard-Pearson House Trust, under the Apex Historical Society umbrella. Generous support and countless hours of hard work have made the house into what it is today: a museum of rural living which offers educational tours for adults and children alike. Not only is the Maynard-Pearson House an example of restoration and preservation, it is a source of inspiration for period furnishings. Careful tour visitors will recognize names at the Maynard-Pearson House as those they’ve seen at the Apex Cemetery. This 1901 house was built by Mr. Malpheus “Mac” Upchurch. A colorful downtown general store owner, Mac and his wife Lessie had seven children, all of whom worked on the family’s several farms. After Mac’s death in 1945 and Lessie’s in 1947, the house was purchased by Miss Emma Ball who converted it into three apartments. After her death in the 1980s, the house fell into disrepair. During an Apex revitalization period, the house was restored to its roots as a one-family dwelling. Harvey and Pat Shankle bought the house and lived there for several years. Jay and Debbie Douglass bought it in 2001 and have worked tirelessly to refurbish, restore, and update this lovely home for their family. The roof, heating-air conditioning, chimneys, and exterior wood work have been up fitted and all the exterior paint has been stripped and replaced. The first floor features a family room, kitchen, large dining room, master suite, and two guest bedrooms. The second story hosts rooms for the two Douglass children. Debbie designed and made the window treatments throughout the house. Carefully selected antique furnishings complete the charm of a totally livable historic home. The 1914 National Register of Historic Places Union Depot was open as part of the tour for the first time. Older than the town itself, the Apex Cemetery reflects the lives of many families who were integral in its birth. The grounds are behind the site of the original Apex Baptist Church in the 300 block of South Salem Street. 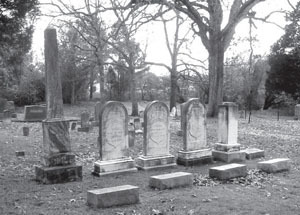 At one time, the Baptists shared the cemetery with a Presbyterian church. During the 1960s, Mr. Arthur H. Rogers deeded approximately five acres to the Town of Apex for its use. are chiseled here in stone. Familiar names include Pearson, Seymour, Olive, Rogers, Beasley, Jones, Norris, Holland, Maynard, Booth, Butts, Clark, Hunter, Schaub, Howell, Martin, Lassiter, Baucom, Cunningham, Duncan, Poe, Herndon, Benton, Johnson, Cash, Dewitt, and Kelly. The Harward tower (left) is visible from West Williams Street.